Baked Sunday Mornings is a group of talented chefs working our way through Baked Explorations by Matt Lewis and Renato Poliafito. I’m a little early with this selection because I really wanted to make this recipe and won’t have the chance next weekend. This recipe is deceptively easy. The results are so elegant that guests would think you went to a lot of trouble to make something special for them. I used Sourdough Bread (yes, it’s a California thing!) 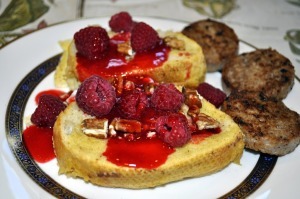 for the French Toast and Chambord in the Raspberry Sauce. I used Pecans which I added 8 minutes before the French Toast was done baking. I love that you can make the French Toast the night before then just throw it in the oven the next morning while you make the Raspberry Sauce! The Raspberry Sauce itself was a revelation. It is so good and so easy to make! It would be wonderful on all kinds of things: ice cream, pound cake, pancakes, etc.! 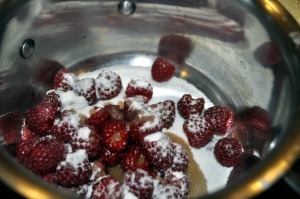 The only thing I would do differently next time is to add a Tablespoon, or 2, of sugar to the custard mix. I will definitely make this the next time we have overnight guests – let’s see how many offers that gets me! 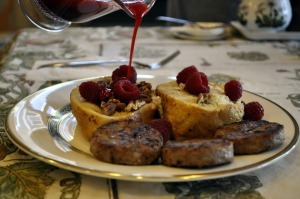 We served it with Farmer John Sausage – perfection! Oh, this looks fabulous, Susan! 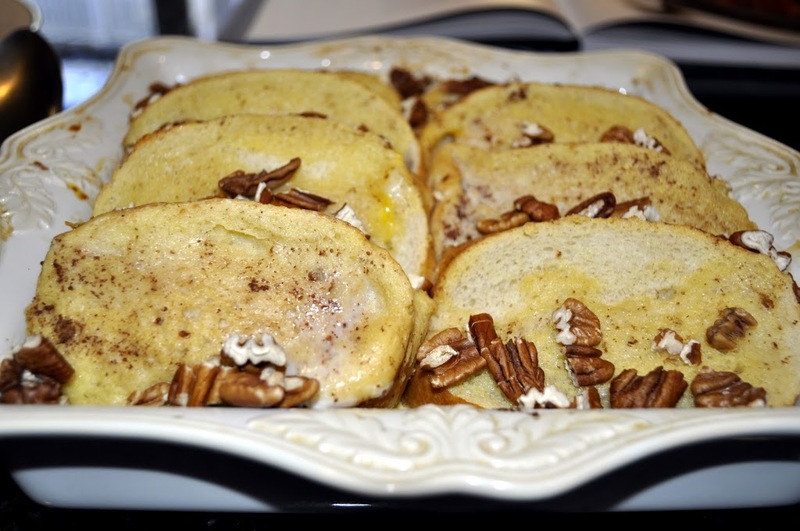 If my in-laws visit next weekend (not sure yet…the Big 10 b-ball tourney is in town), I think I’ll make this for breakfast. Perfect for company~and I’ll definitely add some sugar to the custard as you’ve suggested. Yours looks beautiful and I agree, the sauce was delicious! I thought the same thing about adding a tablespoon or so of sugar as well…. just a tad. Overall, I was really happy with the recipe, and yours looks divine! I don’t think I’ve ever had French toast made with sourdough — it looks fantastic, I’m going to have to try this! Looking at the beautiful raspberries in your photos is making me hungry, yum!